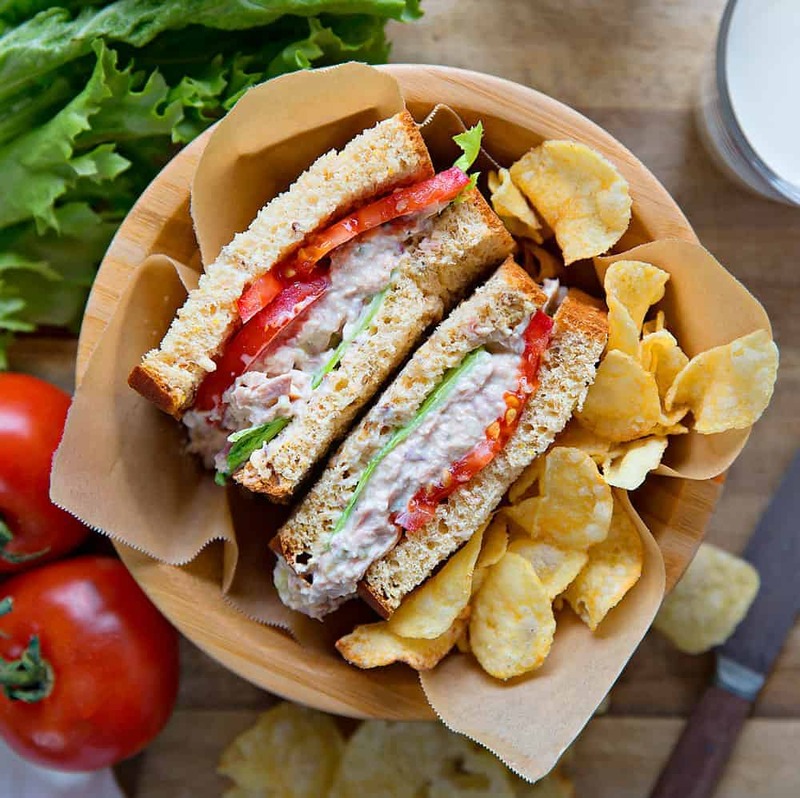 A Tuna Salad Sandwich is one of my kid’s favorite after-school snacks. It is definitely one of my go-to meals when I am hungry and want something fast! We love Tuna recipes and this Tuna Mornay, Tuna Melt Casserole, and Open Faced Tuna Melt are some of our favorites! This is a flavor-packed tuna salad recipe. I admit, there are days when I grab a can of tuna, add some mayo and celery salt and am done! 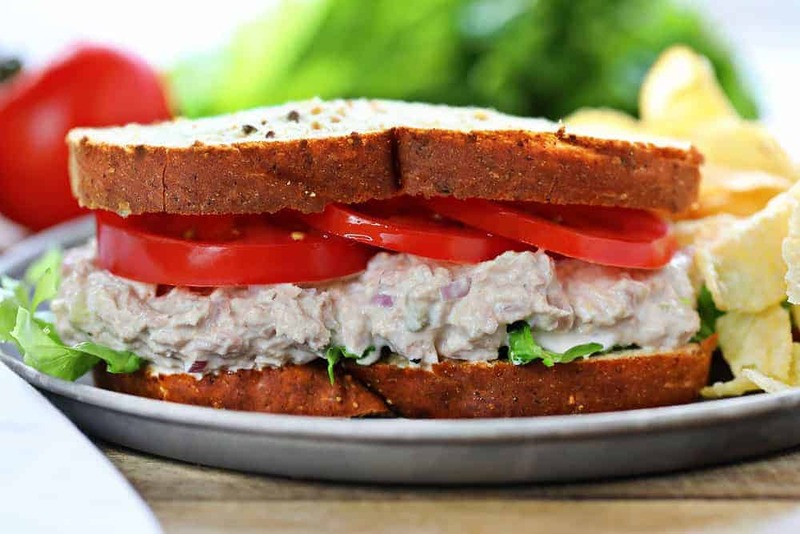 But there are also times that I want the most satisfying and delicious tuna salad sandwich ever… and this recipe fits the bill. To this recipe, I add mayonnaise, seasonings, and shallots. The crunch comes from the onions, so I do recommend picking the best (freshest) shallot you can find. 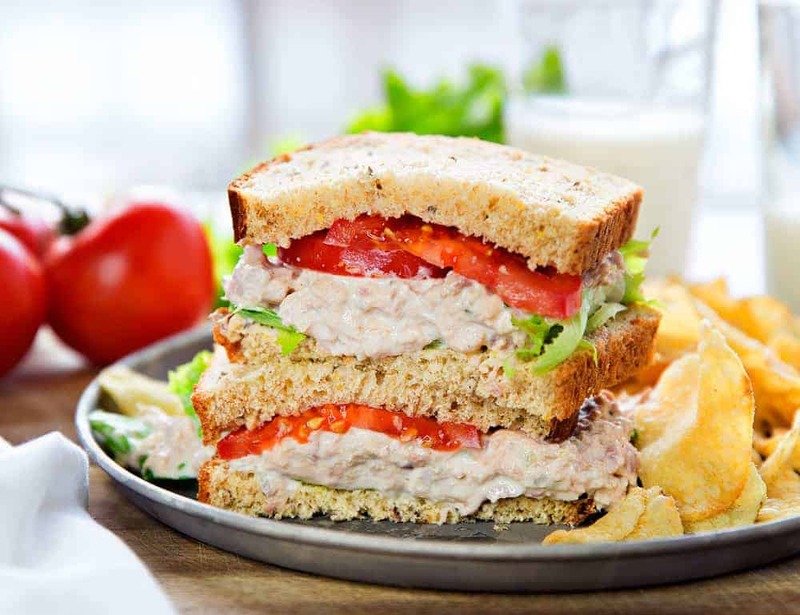 The easiest way to make a tuna salad sandwich is to prepare the tuna salad, get your bread, and start layering. Our favorite (and the most classic way of eating tuna salad) is to grab a piece of bread (not toast! ), lay lettuce on the bread, scoop the tuna salad on top of the lettuce, add sliced tomato, and then cover with another piece of bread. 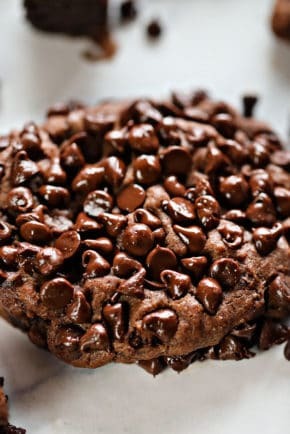 Serve with some chips or fries and you are good to go! Easy ingredients combine to create what I am sure will be your FAVORITE tuna salad recipe! The formula could not be easier: Prepare, Combine, Assemble, Enjoy! I like to chop all the shallots, pickles, and garlic and then start the assembling process. I also like to make each sandwich upon request. The longer the tuna salad sits on the bread the soggier it may be. I prefer using a tuna canned in water. When you are draining the tuna prior to use, as most recipes will recommend, you could lose some of the flavor if it was packed in oil. Tuna packed in oil can absorb some of the flavor of the tuna. In general, water-packed is usually what folks choose because it has fewer calories and retains more omega-3s. Not to mention it can taste “fresher”. One thing that I highly recommend is to make sure that you fully drain the water from the packed tuna. Extra moisture in the tuna salad is not typically considered a good thing. 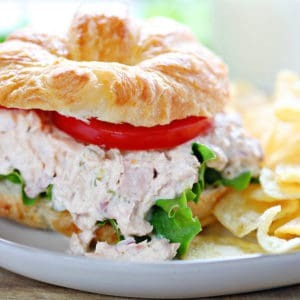 A watery tuna salad mixture will make the sandwich a little sloppy and could also make the bread soggy. How Long Does Tuna Salad Last? This recipe makes a lot of sandwiches, so you may need to refrigerate the leftovers. To maximize the shelf life of tuna salad for safety (and make sure it still tastes good! ), refrigerate the tuna salad in an airtight container for up to 3-5 days. The great thing about tuna salad is that it can be changed up based on what you have on hand. Keep the ratios the same as the recipe below but swap out what you love. Greek Yogurt– Replace the mayo with yogurt for a healthier and lighter option. Red Onion– I prefer shallots as they have a wonderful onion flavor but are not overpowering. Some folks really prefer a strong onion flavor and opt for red onion or even a sweet onion. Celery– This recipe utilizes celery salt, but if you want even more crunch and texture you can add in chopped celery. I would not remove the celery salt, but you could decrease the amount. 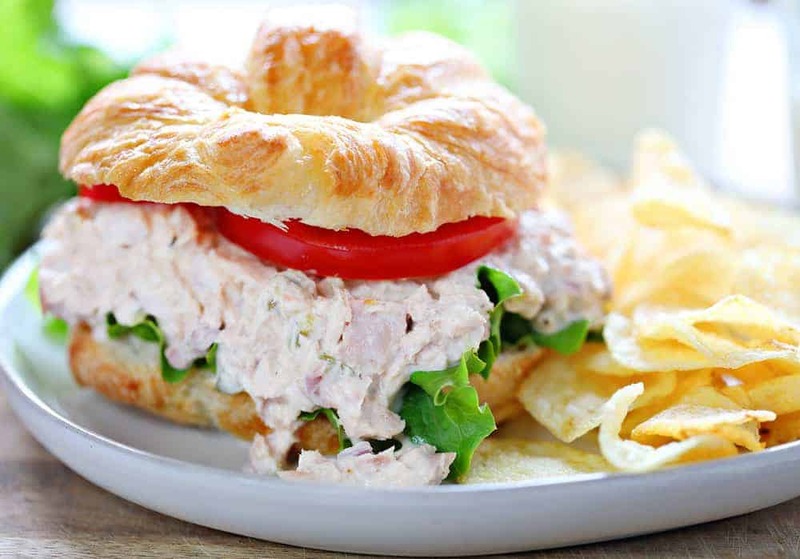 Croissants– My favorite way to eat tuna salad! However, I have to remember to buy them special because it’s not something we normally have on hand. 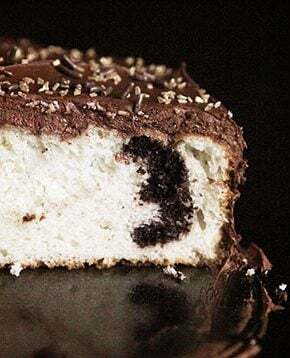 Our next favorite option is 12-grain bread, but in truth, any sandwich bread will work! Make it a Wrap – Completely change the game by making it a tuna salad wrap. We use a flour tortilla, some romaine lettuce leaves, tomato, sometimes some extra pickle and wrap it all up! 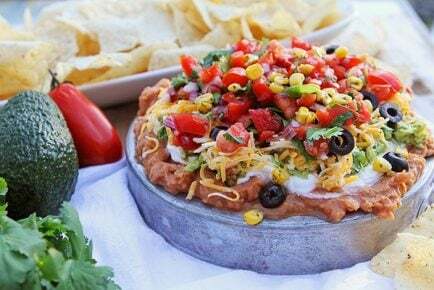 This is also a great alternative if you are taking these on a picnic because the tortilla holds everything together nicely. 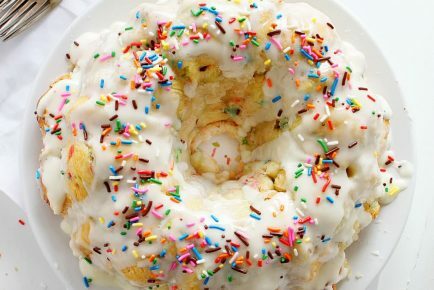 Feel free to get creative and add/replace your own favorite ingredients. 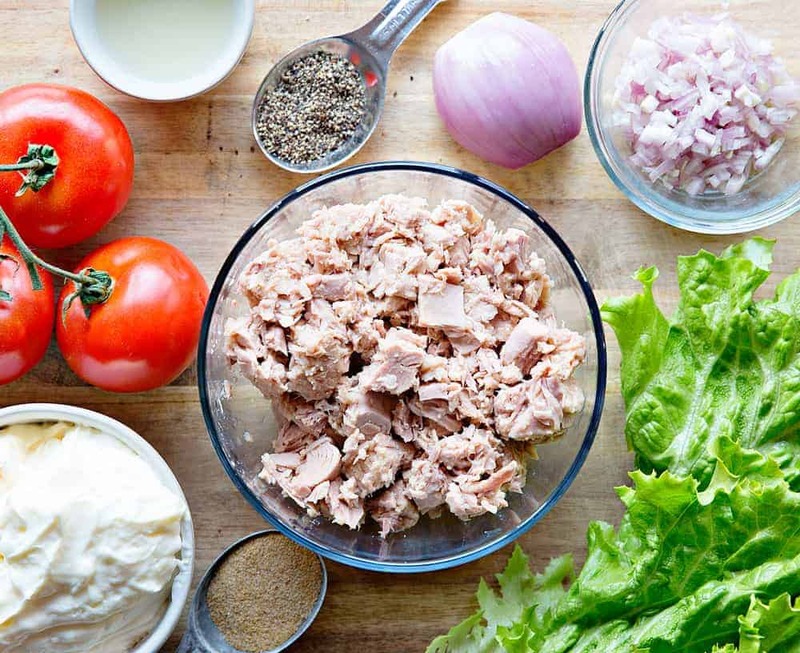 This will be your new go-to recipe for tuna salad! In a medium bowl, combine tuna, mayonnaise, celery, salt, shallot, pickle, lemon juice, garlic, salt, and pepper. Lay a piece of bread on your plate (or slice a croissant) and top with lettuce, tuna mixture, and then a slice of tomato. This looks like the perfect recipe for a great tuna sandwich!! Can’t wait to make it!! Sounds delicious!! Thank you for sharing. That’s a lot of mayo for one can of tuna, I d only use enough to keep the ingredients together, 1/4 to 1/3 cup. Love the pickle juice and lemon to brighten the salad. The recipe calls for 4 cans of tuna. Three total teaspoons of salt for this recipe with the lemon juice, dill pickle pieces, AND mayo?!?? I just made this, only used two of the teaspoons, and it is borderline too salty. Otherwise tasty. But made as the recipe calls for…high blood pressure city! I made this with a 12 oz can of tuna and half of the other ingredients listed. I would caution anyone following this recipe to leave the salt out until the very end! It turned out way too salty for me. Next time! The recipe calls for FOUR (5 ounce) cans of tuna. So yes, if you decrease the tuna amount you will also need to decrease the salt amount. In trying to reduce recipe for one person, I realized what might happen if you don’t READ the recipe!! It is a beautiful sandwich! 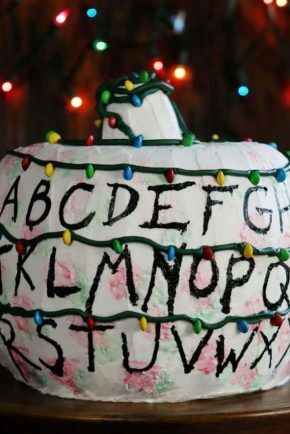 ‘Can’t wait to make it! I use hummus instead of mayo and diced green apples shredded carrots and little bit of dried cranberries. Wonderful. I used fresh caught albacore tuna, canned by my friend, Kai Huddy. Delicious in your salad recipe. 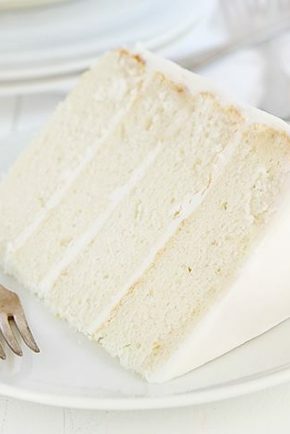 Which tuna brand and type do you use to make it come out so white and fresh looking? Haven’t found one yet! I’m not a fan of onion in tuna salad or chicken salad for that matter. I’d use green onion tops or chives and not too much of either. I wouldn’t use garlic either. To cut down on salt, you can buy celery powder. Also, celery itself has salt as does the tuna and mayo. I’ve never had it with dill pickle or lemon juice – wouldn’t that make it soggy? Long story short, only three ingredients for me – tuna, celery, mayo. Good bread, lettuce and tomato. Not very adventurous, but good! I prefer miracle whip for tuna. Love this good olé fashioned sandwich recipe. It was absolutely fantastic too . Decrease the mayo. Too wet plus too much salt . Also I dont use dill pickle usually green onion or shallot. I like finally chopped up celery. . Why lemon juice.